Grinspan's syndrome, a rare clinical entity reported by Grinspan in 1966, is a symptomatic triad including diabetes mellitus, hypertension and oral lichen planus common in the elderly. The definitive diagnosis of this condition is established by correlating the medical history and clinical examination along with histopathological interpretation of the lesion. We present a case report of a clinical variant of Grinspan's syndrome of a 48-year-old female patient with a significant clinical triad of Grinspan's syndrome. Lichen planus is a chronic mucocutaneous disorder that is mediated immunologically. It was first described by British Physician Wilson Erasmus in 1869 and it is thought to affect 0.5%–1% of the world's population. Lichens are a primitive plant that consists of symbiotic algae and fungi and the word planus in Latin means flat. Lichen planus has varied clinical manifestations affecting the skin, oral mucosa, nail, genital mucosa, and scalp. This lesion has well-established clinical features and histological features that aid in the diagnosis. The condition might be associated with multiple causative/exacerbation factors which include chronic infection, systemic disease, endocrine disorders, allergies, psychological stress, tobacco chewing habit, graft-versus-host disease, and genetics. In regard to the pathophysiology, it is a T-cell-mediated disease autoimmune in nature where the CD8+ T-cells trigger the apoptosis of oral epithelial cells at the basal layer. However, precise cause of lichen planus is unknown. Oral lichen planus (OLP) may be associated with several other systemic diseases. In 1963, Grinspan et al. found an interesting association of OLP with diabetes mellitus (DM) and vascular hypertension (blood pressure) and hence called Grinspan's syndrome. Oral lichenoid reactions (OLRs) are considered variants of OLP. OLP and oral lichenoid drug reactions have similar clinical and histological findings. It is associated with the administration of a drug, contact with a metal, foodstuff, or systemic disease. The increased occurrence may, in part, be caused by the introduction of numerous new categories of medications that have a greater tendency for lichenoid reactions as a side effect. Most often, antibiotics, antihypertensives, gold compounds, diuretics, antimalarials, and nonsteroidal anti-inflammatory agents are responsible for lichenoid reactions., Drug therapies for DM and hypertension are capable of producing lichenoid reactions of the oral mucosa. However, the precise relationship is not clear. Here, we present a rare case of OLP in a patient with the medical history of diabetes and hypertension. A 48-year-old female patient reported to the department of oral medicine and radiology with the chief complaint of burning sensation in the mouth since 1 month with severity increasing while taking spicy food substances. Medical history revealed the patient to be type II diabetic for duration of 15 years and a hypertensive for the past 12 years. She was being treated with Huminsulin-R 1 U/kg/day and amlodipine 5 mg and metoprolol 50 mg daily. On general physical examination, the patient was found to be well nourished and moderately built without any deleterious habit. On extraoral clinical examination, there were no cervical lymphadenopathy and no extraoral lesions. On intraoral examination, generalized diffuse gingival lesion was seen buccally and palatally involving the marginal and attached gingiva, which was erythematous, with interspersed areas of hyperkeratosis, soft and edematous in consistency, nontender, exhibiting bleeding on probing, and with a distinct white linear pattern at its apical extent [Figure 1] and [Figure 2]. On right buccal mucosa, hyperkeratotic white radiating striations were seen in reticular pattern extending 2 cm from corner of mouth till retromolar pad. On palpation, striations were nontender and nonscrapable [Figure 3]. The investigation undertaken included routine hematology, fasting and 2 hour postprandial blood glucose level. 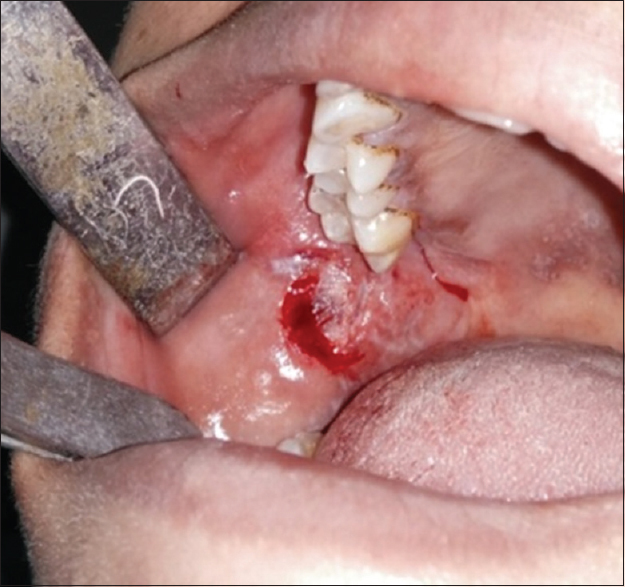 An excisional biopsy of the buccal mucosal lesions was made under local anaesthesia (LA) and subjected to histopathological evaluation [Figure 4]. 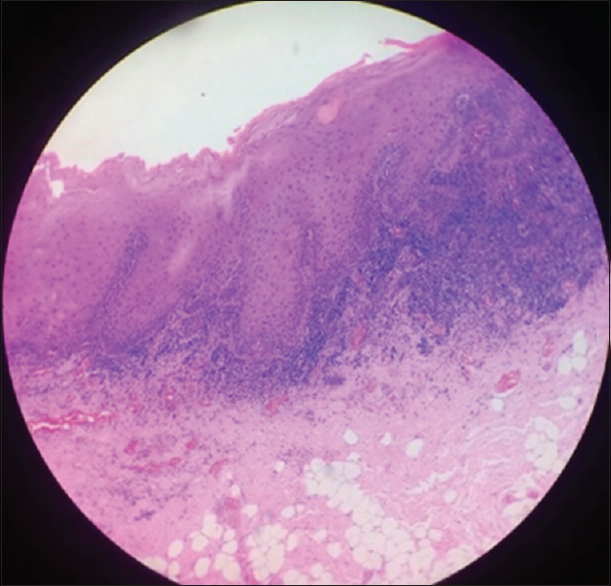 Histopathological examination of the lesion confirmed the lesion to be lichen planus [Figure 5]. The histopathological section exhibited parakeratotic stratified squamous epithelium. Basal cells showed degeneration. A band of chronic inflammatory cell infiltrate was noted in the subepithelial portion of connective tissue. Deeper areas showed fibrous and adipose tissue. Thus, it confirmed the lesion to be lichen planus. Correlating the patient's systemic background of diabetes and hypertension with the histopathological finding suggestive of lichen planus, a clinical diagnosis of Grinspan's syndrome was made. Topical corticosteroids and vitamin supplementation were prescribed to alleviate the symptoms of OLP. She was also referred to her physician, who changed the medication. The patient was kept under periodic review to assess the progression of the lesion. 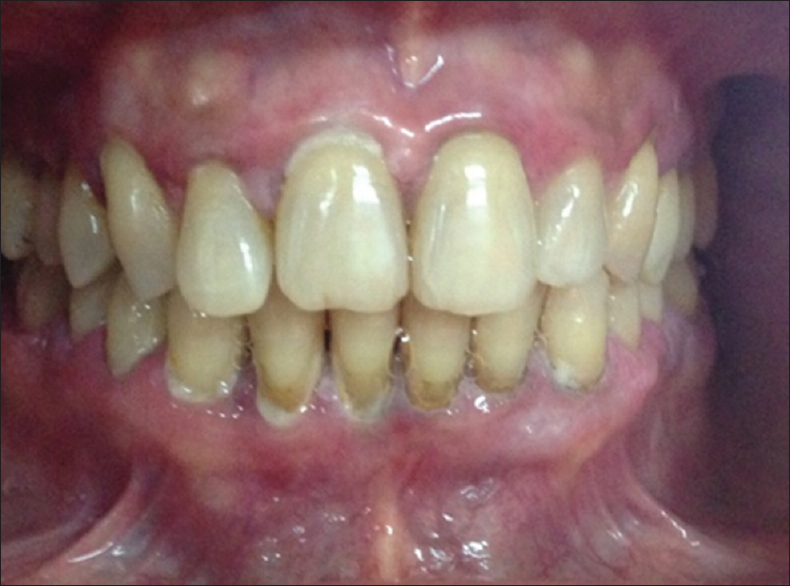 After modification in medication, oral lesions had showed improvement at follow-up visit after 1 month [Figure 6]. In our case, the patient was on medical treatment with metoprolol which belongs to beta-blockers a group of antihypertensive drugs and recognized as being capable of producing such as OLR. There have been reports of association between LP and DM. The prevalence of DM in patients with OLP has been reported to range from 10% to 85%., It has been proposed that the endocrine dysfunction in DM may be related to an immunological defect that may also contribute to the development of OLP. The prevalence of OLP is significantly higher in patients with type 1 DM and slightly higher in patients with type 2 DM than in controls. It suggests that various medications on hypertension and DM can cause lichen planus like lesions. Further, the presence of these oral lesions in diabetic and hypertensive patients could be attributed to the fact that these patients also suffer a severe mental stress which is considered as one of the causative factors for OLP. Management of OLP/OLR mainly consists of symptomatic relief and long-term follow-up period due to the probability of malignant transformation. Topical corticosteroids have been shown to be the most predictable and effective medications for controlling the signs and symptoms of OLP. Occasionally, systemic steroids are indicated for brief treatment to severe exacerbations or for short periods of treating recalcitrant lesions that fail to respond to topical therapy. Prednisone 0.50–0.75 mg/kg/day for <10 days without tapering is recommended by many clinicians. Often, combination topical and systemic therapy may prove more beneficial than any single modality. Systemic and topically administered all-trans retinoic acid, Vitamin A, systemic etretinate, and systemic and topical isotretinoin all have shown some measure of efficiency in open studies or anecdotal case reports. Topical retinoids are usually favored over their systemic counterparts because the latter may be associated with adverse side effects such as liver dysfunction and teratogenicity. In our case, we have prescribed topical steroid triamcinolone (0.1%) along with Vitamin A supplements and complete oral prophylaxis was carried out. The patient was kept under regular follow-up period for every 1 month. Any patient suspected of having OLP or OLR should be asked about detailed medical history and systemic medication. It is important for dentist to educate patients about the oral implications of DM and hypertension. A change in medication should be considered after consultation with the patient's medical physician. Early diagnosis, withdrawal and/or replacement of the causative drug, and appropriate management strategies are essential to improve the quality of life of a patient who is suffering from Grinstspan's syndrome. The malignant potential of lichen planus is an area of much controversy. However, despite the current uncertainty about the probability of malignant transformation of OLP, the fact that such transformation may occur seems increasingly certain. 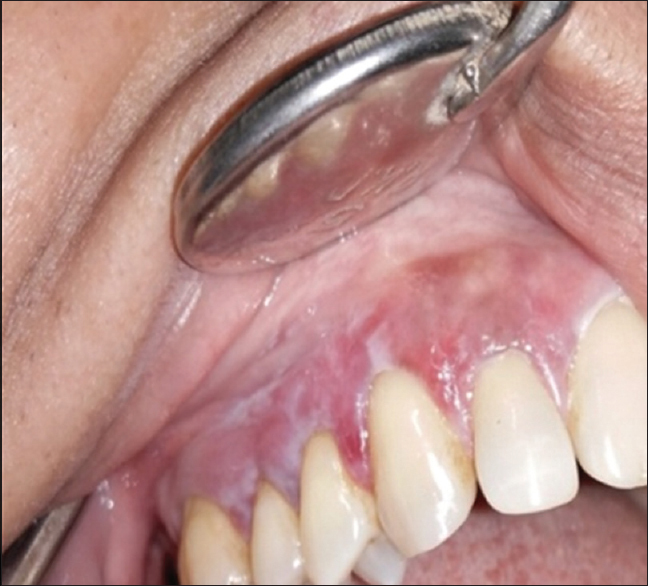 Hence, it is mandatory in patients with oral lesions of lichen planus, even if asymptomatic or barely symptomatic, the long-term follow-up is highly recommended. Grinspan's syndrome is a rare association of a triad of symptoms: erosive OLP, DM, and hypertension. It is important for dentist to be familiar with the medical management of patients with DM and hypertension. By taking an active role in the diagnosis and treatment of oral conditions associated with both of these diseases, dentist also may contribute to the maintenance of optimum health of an individual. Neville BW, Damm DD, Allen CM, Bouquet JE. Oral and Maxillofacial Pathology. 2nd ed. Philadelphia: W. B Saunders; 2002. p. 680-7. Rajendran R, Sivapadasundaram B. Shafer's Textbook of Oral Pathology. 7th ed. New Delhi, India: Elsevier; 2012. p. 808-12. Ismail SB, Kumar SK, Zain RB. Oral lichen planus and lichenoid reactions: Etiopathogenesis, diagnosis, management and malignant transformation. J Oral Sci 2007;49:89-106. Eversole LR. Immunopathogenesis of oral lichen planus and recurrent aphthous stomatitis. Semin Cutan Med Surg 1997;16:284-94. Grinspan D, Diaz J, Villapol LO, Schneiderman J, Berdichesrcy R, Palese D, et al. Lichen ruber planus de la muqueuse buccale sone association a un diabetes. Bull Soc Franc Dermatol Syph 1966;73:531-41. Kaomongkolgit R. Oral lichenoid drug reaction associated with antihypertensive and hypoglycemic drugs. J Drugs Dermatol 2010;9:73-5. Wright J. 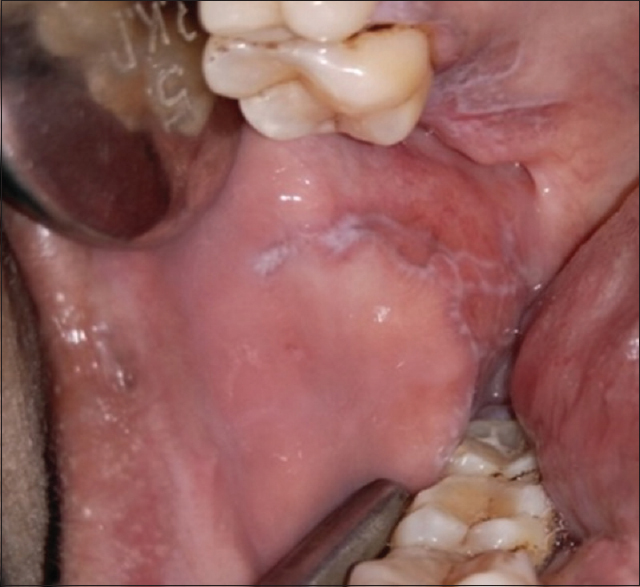 Diagnosis and management of oral lichenoid reactions. J Calif Dent Assoc 2007;35:412-6. Ţăranu T, Esanu I, Grigorovici M, Toader MP. Grinspan's syndrome. Rom J Oral Rehabil 2013;5:22-6. Sugerman PB, Savage NW. Oral lichen planus: Causes, diagnosis and management. Aust Dent J 2002;47:290-7. Pirmohamed M, Madden S, Park BK. Idiosyncratic drug reactions. Metabolic bioactivation as a pathogenic mechanism. Clin Pharmacokinet 1996;31:215-30. Lamey PJ, Gibson J, Barclay SC, Miller S. Grinspan's syndrome: A drug-induced phenomenon? Oral Surg Oral Med Oral Pathol 1990;70:184-5. Howell FV, Rick GM. Oral lichen planus and diabetes: A potential syndrome. J Calif Dent Assoc 1973;1:58-9. Lundström IM. 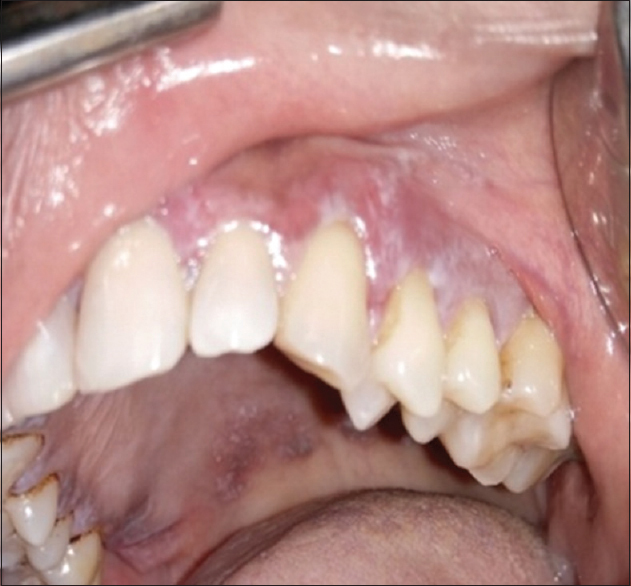 Incidence of diabetes mellitus in patients with oral lichen planus. Int J Oral Surg 1983;12:147-52. Petrou-Amerikanou C, Markopoulos AK, Belazi M, Karamitsos D, Papanayotou P. Prevalence of oral lichen planus in diabetes mellitus according to the type of diabetes. Oral Dis 1998;4:37-40. Bagewadi A, Bhoweer AK. Oral lichen planus and its association with diabetes mellitus and hypertension. J Indian Acad Oral Med Radiol 2011;23:S300-3. Eisen D. The clinical manifestations and treatment of oral lichen planus. Dermatol Clin 2003;21:79-89.